Thank you for visiting abruckner.com., an online discography of Anton Bruckner's symphonies and orchestral compositions and home of the Bruckner Society of America and the Bruckner Archive. This discography is an attempt to list every Bruckner orchestral recording offered to the public. This includes commercial recordings, pirate recordings, radio transcriptions that were in general release (i.e. not custom copies), and some limited promotional distributions. The completeness of this discography is the result of a world-wide effort. Many people offer their time and information to keep this discography up-to-date. I welcome any information and suggestions that you may have. Abruckner.com is also the home site for the re-activated Bruckner Society of America. All news and publications are available here. The Bruckner Society is a non-profit private foundation. Donations are tax-deductable. 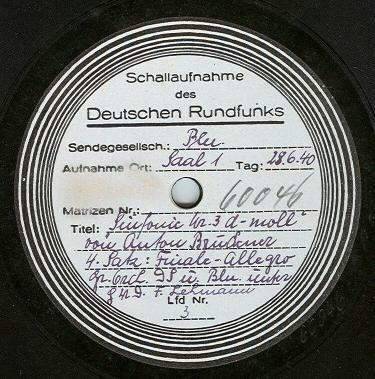 Abruckner.com offers access to the Bruckner Archive, one of the largest collections of Bruckner recordings in the world. Hans Roelof's incredible discography of Bruckner's vocal and instrumental music. has become inactive as of January, 2019 due to Mr. Roelof's declining health. That website's server costs are now being supported by abruckner.com. Check out my store for hard-to-find Bruckner CDs and collectables! Keep up-to-date with my latest news and new releases. Don't forget to sign up for my monthly newsletter that will keep you informed of new releases and downloads. Please use the links on the right to ArkivMusic.com and Amazon for any of your online purchases. Enjoy the discography and please feel free to contact me with any questions or comments.